This introductory photography class is designed to get you more familiar with your DSLR (or any interchangeable lens) camera. If you feel your camera has a ton of buttons, dials, and features that you’re unfamiliar with, this evening of instruction in a small classroom setting is for you. Our goal in this class is to get you off of the AUTO setting and taking full creative control of your DSLR or mirrorless camera. The difference between a pro-level camera and a point & shoot is control. 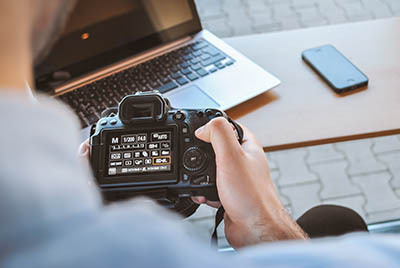 One of our working professional Perfect Image instructors will help you master your DSLR and its many features to help you fine-tune your images to achieve more control over light, color, and focus. Whether you shoot with a Nikon, Canon, Sony, or any other brand of DSLR or mirroless camera, our Intro to DSLR Photography class can help you learn to get the most of your shots!